Bioswales are a form of bioretention designed to slow surface water runoff and help in the removal of stormwater pollutants. Also known as infiltration swales, Bioswales are a form of bioretention designed to slow surface water runoff and help in the removal of stormwater pollutants. Like standard ditches, they transport large volumes of stormwater to a discharge point. Unlike ditches, they slow down the movement of runoff allowing the water to be cleaned and filtered along the way. 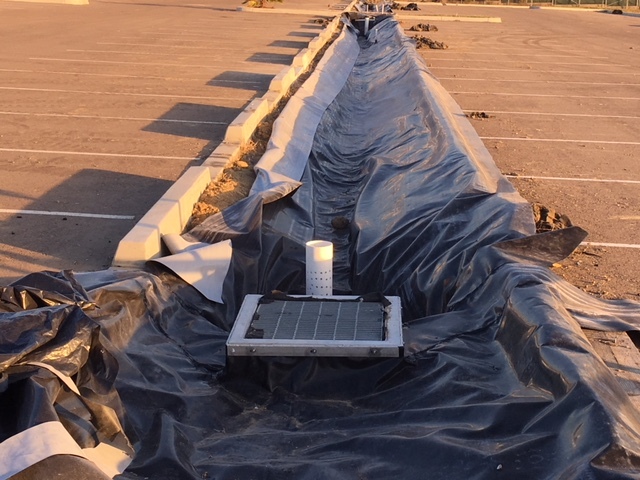 These Bioswales can be used in many applications including pollutant removal, drainage retrofitting, and runoff management. Some of the advantages of Bioswales are that they require little maintenance, they remove pollutants from runoff, and they are able to recharge the groundwater. In our Bioswales we recommend useing Enviro Liner® 1000 (EL1000). This is a specialized polyethylene flexible membrane liner material that has been developed for medium term performance applications. Enviro Liner 1000 is placed to prevent premature infiltration into the ground. In 30 and 40 mil thicknesses, EL1000 comes with a light colored top skin layer (light grey or white) and a black layer on the bottom. The light colored face helps to identify potential sheet damage and leaks (if the light colored top skin layer is damaged it will normally show the black core layer). The light colored face also reflects sunlight better than the black face, helping reduce wrinkles caused by thermal expansion and contraction. Enviro Liner® 1000 is a flexible membrane liner that can be factory fabricated so that it can be delivered to site as large panels. We can also produce 22.5 ft wide roll stock by special order.